It's pretty safe to say that I'm very ready for fall. As much as I love warm weather, I get sick of it around this time every year. Too bad it's supposed to be in the upper 80's in L.A. for the rest of this week! There was a slight chill in the air this past weekend and I immediately busted out my leather jacket and ankle booties. I don't know about you, but when it comes to adding color to my fall wardrobe, I'm all about jewel tones. Happy Wednesday everyone! You look amazing as always and LOVE your hair! So cute- love the jacket! You look so chic! That leather jacket will always be a favorite and paired with those booties, ugh, so good! Great outfit and I'm loving your hair! LOVE this outfit, audrey!! you look fabulous. that jacket and those booties are to die for. i am so ready for fall, too!! I am so ready for Fall too! This outfit is making it hard for me to resist pulling out my jeans and jackets! You look great Audrey! Love these colors. I love cooler weather so I'm ready for fall as well! I love this outfit so much, Audrey! It's everything fall should be! 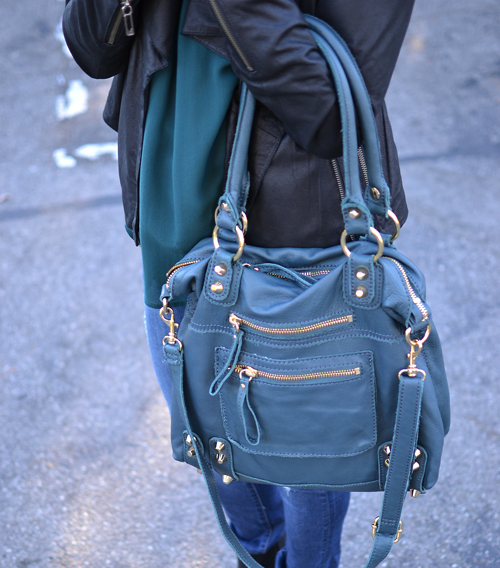 That bag is so gorgeous, it's one of my faves, and I love the jewel tones! This also has me super excited to bust out the booties this fall! Can't wait!